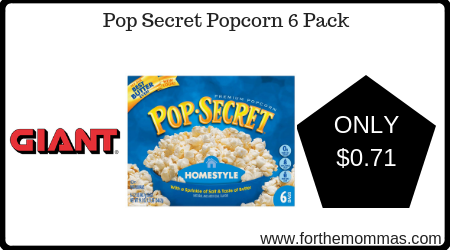 Giant: Pop Secret Popcorn 6 Pack ONLY $0.71 Each Starting 12/7! We have a great deal to make savings at Giant. Pop Secret Popcorn 6 packs are priced at $3.00 each, plus you will earn $10.00 in gas rewards points that will further reduce the price. Stack these offers with an Ibotta rebate that will make the final price just $0.71 each!